Walking down a makeup aisle and not finding the foundation that matches your skin tone can take its toll. Women of color know this struggle all too well — for so long, many beauty companies offered a limited number of shades for their skin tones. 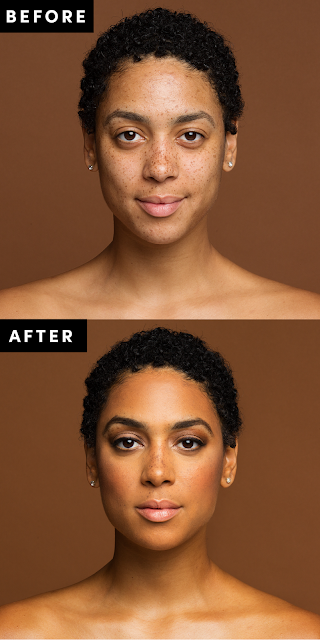 Slowly but surely, that's changing as brands release more shade-inclusive foundation lines. Forward-thinking companies, like Make Up For Ever and its "Blend In. Stand Out" campaign, are celebrating women of a range of complexions by creating shades with them in mind. I called on celebrity makeup artist Jackie Gomez, the head of Make Up For Ever's New York Academy, who has worked with Beyoncé, Solange, and La La Anthony, to demonstrate six of her tried-and-true tips on women with an array of dark skin tones. I, along with the women of The Colored Girl, a creative agency that challenges society's beauty stereotypes, share our stories on finding the right foundation. "The first time I ever used foundation was in the sixth grade. I went to a suburban school with all white girls. They all came to school with their makeup done and I thought it was so beautiful. I didn’t see any other girls in school who looked like me wearing foundation but I wanted to look just as beautiful as all the other girls. So I went to the closest Duane Reade after school one day to find a drugstore foundation. I came to school the next day wearing it, and one of my friends looked at me and said, 'That foundation is not your right skin tone.' During that time, I was going through puberty and finding my womanhood, so I had no idea what I was doing. When I was 19, I was color-matched for the first time. "But even still, it’s been difficult because on photo shoots, some makeup artists don’t know how to find the right match for my foundation just because I’m a woman of color. When I first started modeling, I felt like there was always some form of neglect with my makeup. I felt left out because every other model on set would look so beautiful and my makeup didn’t look half as good as theirs. So I made it a priority to learn about the right foundation shade for my skin tone and the elements of my face. Now, I speak up at shoots if I don’t feel like my foundation fits my complexion. It's important that makeup brands capitalize on every shade of beauty and make sure their foundation line is inclusive to everyone." Pro tip: Match the foundation shade with your undertones. To determine your undertone, look at your veins. "If your veins are green, that means you have a lot of olive, yellow, and golden in your skin tone, so your foundation shades should have similar tones," Jackie says. "If you look at your veins, and they’re more blue and red, that means you have a lot of pink, red, and brown undertones, so your foundation should have similar tones. Leyna has olive, yellow, and golden undertones — which is why the golden-tan foundation stick she's holding on the left works for her skin tone. The dark brown foundation stick on the right is for women with red undertones." "I don’t like to cover my freckles, so I usually stay away from foundation and stick to tinted moisturizers. Those typically come in three shades: light, medium, and dark. I’m usually medium to dark, depending on the makeup line. The fact that my skin tone is even considered “dark” is a problem — it shows that even the deepest of skin tones aren’t being represented. "My skin tone changes a lot depending on the time of year so I have to keep that in mind when wearing foundation. In the winter, I’m a super-light complexion, and in the summer, I tan really easily, so I’m a few shades darker. I’ve noticed that sometimes when I go to a makeup counter, they don’t even know how to match my foundation shade. Since I have a medium skin tone, sometimes they'll match me with a foundation that looks way too orange. So I always look in the mirror and make sure I’m comfortable with my foundation before walking out." Pro tip: Mix together two foundation shades. For women who have too many foundation shades at home — and none of them are the right one — it’s time to experiment. Depending on your undertone, Jackie suggests mixing a lighter foundation shade with a darker one to find the perfect medium. 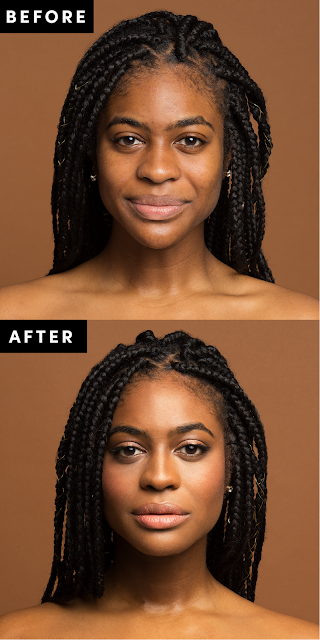 “If you have a deeper skin tone, you can add more of the darker foundation, and if you’re lighter, add more of the lighter foundation until you get a shade that matches your complexion,” Jackie says. For a flawless finish, apply the foundation with a sponge, which will allow you to build upon your application. "I’ve been on plenty of photo shoots where the makeup artist didn’t color-match my foundation correctly. Even though a lot of women of color are similar in complexion, our undertones are completely different. It’s really important to find your shade and test it out. It’s also been easier for me to find concealer to buff out my dark spots rather than find foundation. I’m not the same shade in December as I am in July — I’m at least two to three shades darker — so it’s important for women of color to get color-matched every season." Pro tip: Test three different foundation shades by swiping them on your décolleté. Jackie says this is the best part of the body to match your shade. “Women of color have different shades on their face," she says. "Some elements of their skin tones are dark, and others are light. 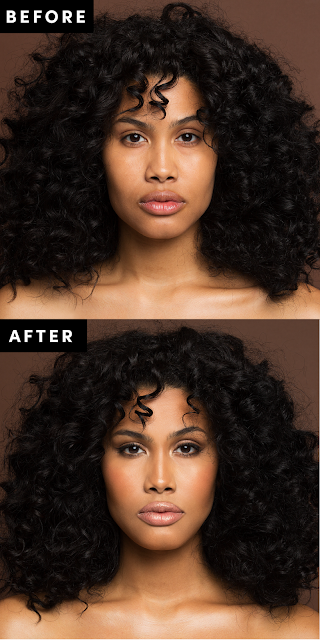 Their foundation should always match this area of their body, so their overall foundation tone looks more natural." 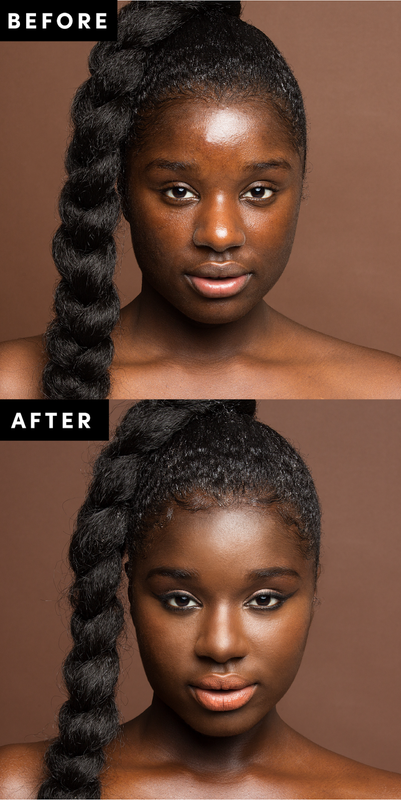 "I’ve always loved makeup but I grew up thinking foundation wasn’t made with my skin tone in mind. I never wanted to try drugstore foundations because I was afraid I’d come home and be disappointed. So I stayed away from foundation until college. Even given my career in the beauty industry, it’s tricky to find the perfect foundation shade. I’ve tested countless foundations and usually find something off with each of them — too red, too dark, too light, or too ashy. So I stick to mineral powder, because it gives me a natural glow and doesn’t break out my skin. "I come from a lineage of women with beautiful variations of dark skin tones. 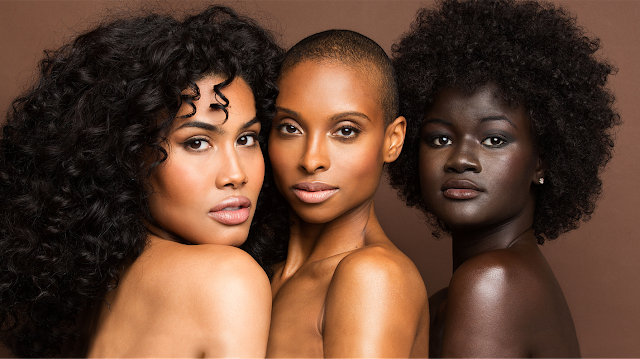 Unfortunately, most of their shades of brown were excluded from the cosmetics industry during that time so they weren’t afforded the opportunities that brown girls have now. I’m thankful that the cosmetics industry is making major strides when it comes to foundation but there’s still more work to be done." Pro tip: Test three different foundation shades by swiping them on your jawline. Jackie says it's another area where you'll find your skin’s natural tone. Like liquid foundations, it's also important to match powder foundation tones to your undertones. “Many powders have a cool pink or red tone, or they have a more golden, yellow tone," Jackie says. "Maya was more golden and yellow, so we went with that powder." 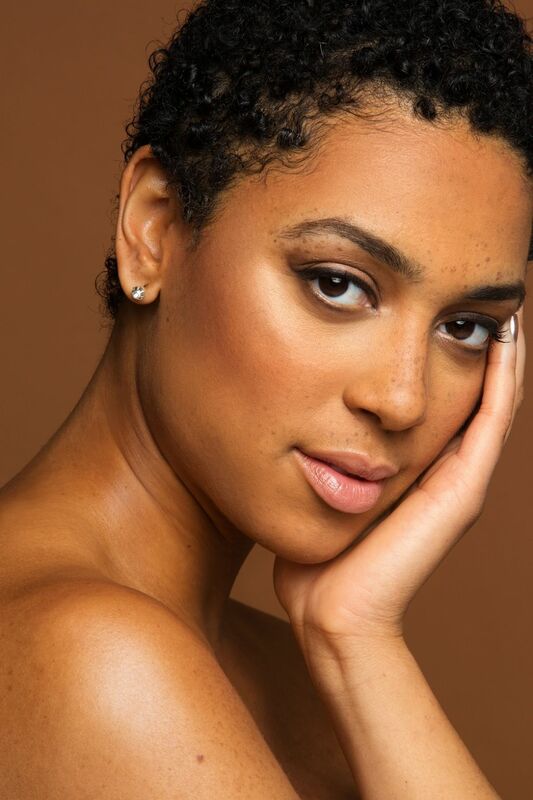 "Back when I first started wearing makeup, I would walk into a makeup store and the consultant would immediately say, 'We don’t have your foundation shade.' A few years ago, I went into a popular beauty store and a woman of color was the makeup consultant. She knew that none of the shades they carried fit me but she was trying to make her commission sale. She started putting all of these different foundations on me and I left looking like a clown. "That was my problem for a while. The dark shades offered by beauty brands would either look super ashy, overly red, or made my skin break out. For women of color, you have to spend a good amount of money to find the right foundation shade. For a while, I gave up foundation altogether and would stick to face oils. A Sephora consultant, who ended up being my good friend, helped me find my match: Make Up For Ever Ultra HD Foundation. It’s the first foundation I started using that was actually the right color for me. 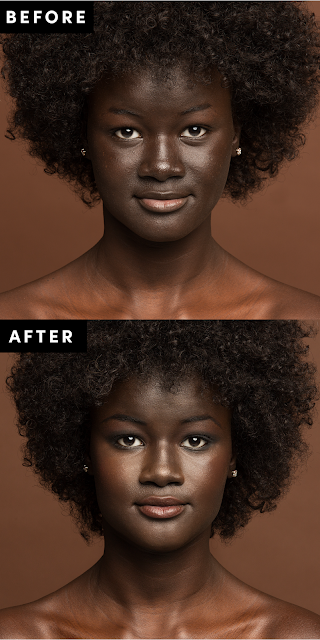 "People think because you have dark skin that all dark shades work. For example, my best friend Khoudia’s undertones are more blue and mine are more red — so we wear two different shades. Dark skin is not an anomaly. Now in 2017, black women are refusing to subject themselves to European standards of beauty. The game is changing, which is amazing." Pro tip: Use a lighter foundation on your T-zone area and a darker foundation on the outer corners of your face. 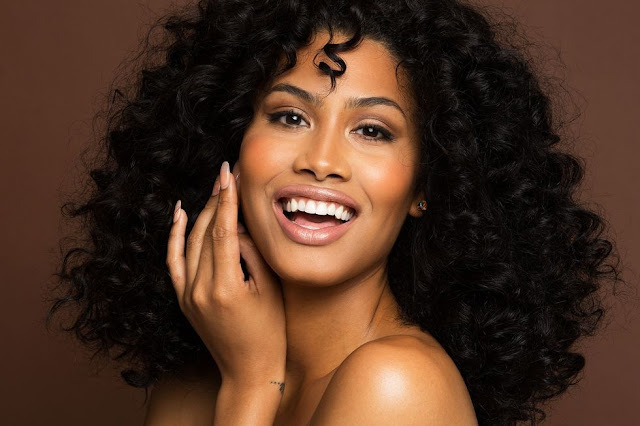 Women of color often have lighter tones in the center of their faces, while their jawlines and the areas around their hairlines tend to be darker. To give your skin depth, Jackie suggests using a lighter foundation on your T-zone area and applying a darker shade around your hairline and jawline to create a structured contour. "When I first started searching for my foundation, it was the worst moments ever. My sister is a big fan of makeup. I grew up always trying to use her foundation but it wouldn’t work because she was a lot lighter than me. I remember trying to mix her foundation shade with dark brown and black crayons, just so it could match my skin tone. I would scratch the crayon in my hand, add moisturizer to turn it into a liquidy formula, then mix it with her foundation. The craziest thing I ever tried was mixing her foundation with was black mascara. Nothing ever worked so I gave up. "A lot of makeup brands have dark shades but they often don’t think about the deepest ones. Brown-skinned women may find the right foundations but really dark-skinned women like me don’t have that option. 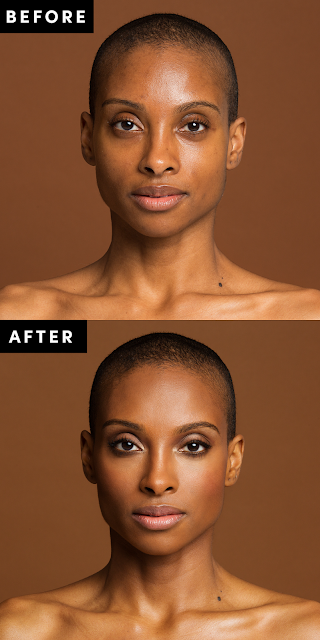 I still don’t wear foundation on a regular basis because it's been so hard to find my match in the past."